Hi everyone! 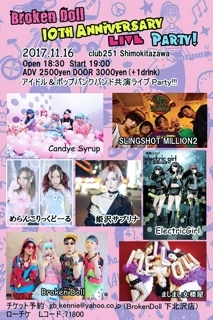 I will organize Harajuku Pop Punk Band BrokenDoll’s 10th Anniversary concert Party on November 16th in Club251 Shimokitazawa. Let’s enjoy together!!! 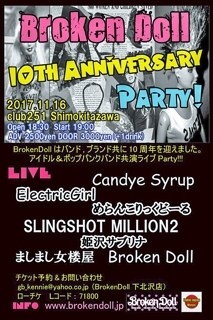 BrokenDoll 10th Anniversary concert in Club251 Shimokitazawa. Enjoy some Idols and Pop Punk band’s concert! If you want book tickets, please contact to organizer Kensuke Iwai.